Sophomore center Bayley Plummer shoots and scores two points while teammate Armani Hampton tries to get in position to catch the rebound during the game vs. Coastal Carolina on Saturday, March 3rd. 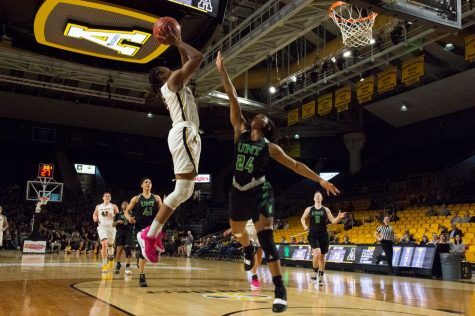 An 8-23 record and a ninth place finish in conference play are the obvious things that come to mind when you think about the App State women’s basketball 2017-18 season. But they are not what define the season. A key injury in the fall lead to tough beginnings for the Mountaineers. 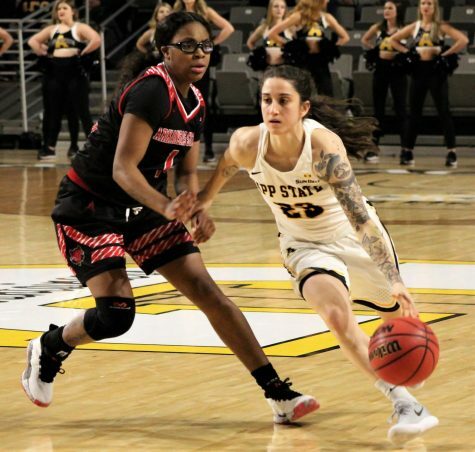 Senior guard Madi Story tore her ACL in an exhibition matchup with Tusculum College on Halloween, which forced her to miss the entirety of the season. In Story, the Mountaineers lost some of their only senior leadership on the court and a projected First-Team all-Sun Belt contributor. 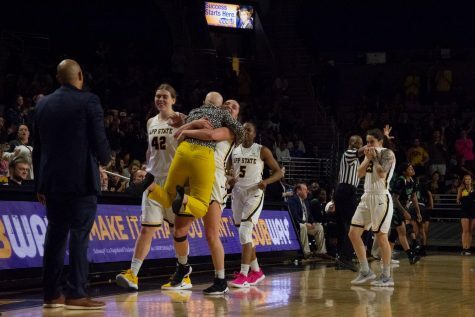 Later in the season, the Mountaineers would also lose redshirt sophomore guard Kaila Craven to injury for the second straight year. 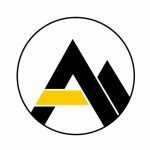 The Mountaineers were also exceptionally young this year, with six freshmen and four sophomores on a roster of thirteen players. Their youth did not stop some of the young players from having impactful seasons, however. 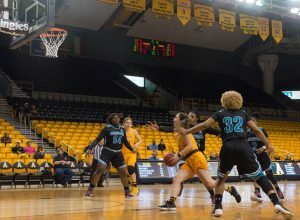 Sophomore guard Nicola Mathews gets in position to take a shot while teammates Bailey Plummer Maya Calder and Lainey Gosnell position themselves around her during the game vs. Coastal Carolina on Saturday, March 3rd. Sophomore center Bayley Plummer blossomed into an outstanding player this season. During her freshman campaign, Plummer averaged 4.3 points per game and was second on the team in rebounds with 5.5 per game. This season she elevated her play to a new level, doubling her scoring average to nine points per game and grabbing a whopping 11.5 rebounds per game. Her efforts were good enough for a Third Team all-Sun Belt appearance. She was one of only four sophomores in the conference to receive postseason recognition. Several freshmen also had good opening seasons for App State this year. Guard Tierra Wilson led the team in total minutes with an average of 34.1 per game and also in free throw percentage with .811. 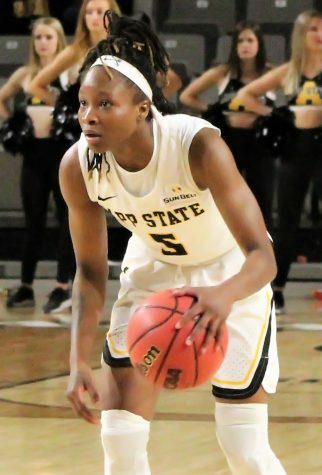 Guard LaPresha Stanley had the highest 3-point percentage of any Mountaineer by more than eight percent, while leading the team in scoring average with 11.4 points per game. 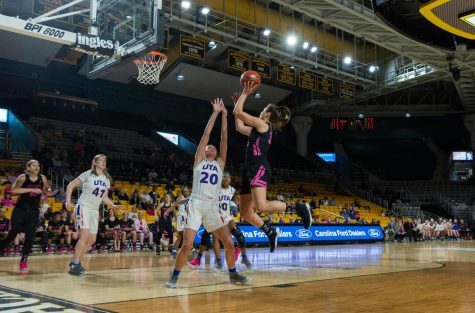 Forward Lainey Gosnell did a little bit of everything, averaging a respectable 7.7 points per game to go along with four rebounds (good for fourth on the team) and eighteen total steals. 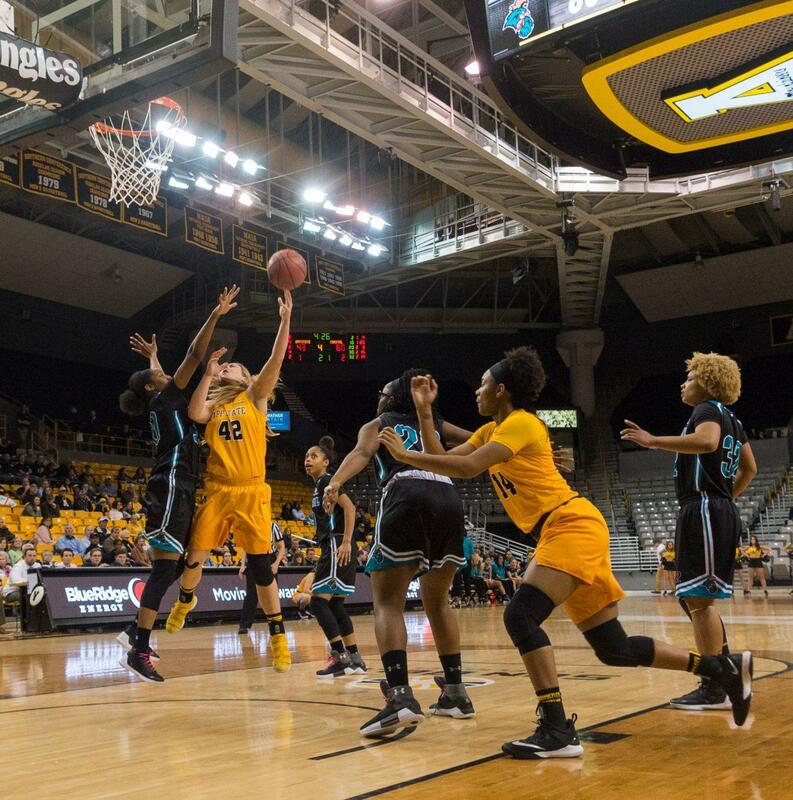 Sophomore guard Nicola Mathews sets up to take a shot to score two points for AppState during Saturday’s game vs. Coastal Carolina. 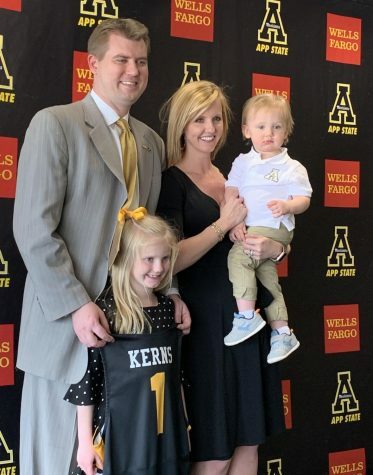 Two of App State’s roster this year were transfer players. Sophomore guard Nicola Mathews had a solid debut season for the Mountaineers, shooting nearly 38 percent from the field and leading the team by 25 in total assists with 94. Junior guard Anna Perez-Gomez averaged only 7:30 minutes per game this season but made the most of them, draining 50 percent of her 32 shots and adding 18 rebounds and 16 assists. While the Mountaineers went only 5-13 in conference play this year, they did end on a high note. They were tabbed as the ninth-seeded team in the Sun Belt tournament and matched with the eighth-seeded Arkansas State Red Wolves, who were defeated by only 2 1/2 weeks prior. App State had a stellar showing, with four players in double digits in the scoring column, including career-highs for Stanley with 27 and Plummer with 18. Plummer also pulled down 19 rebounds while the Mountaineers outrebounded the Red Wolves as a team by nearly 20. The Mountaineers came away with the upset, 79-68 to move on to the Sun Belt quarterfinals. It was here that they would meet their season’s end, taking a loss to the No. 1 seeded Little Rock Trojans 66-34. 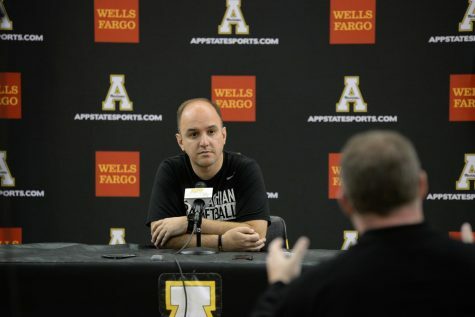 It is easy for someone to look negatively upon this season for App State women’s basketball, but with youth and key injuries getting in their way, it is impossible not to also take positives away. 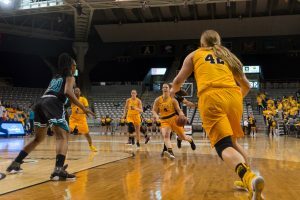 With the prospect of returning almost their entire roster for next season, including key injured players in Story and Craven and the addition of transfer redshirt junior Ashley Polacek, the Mountaineers are poised to make 2018-19 a banner season.